Structure – Walls, Ceilings, Floors, Roof, Basement or Crawlspace and Foundation. Roof and Attic – Roof Construction, Framing, Chimneys, Ventilation, Insulation, Skylights, Gutters and Flashing. Exterior – Grading, Wall Covering, Elevation, Drainage, Sidewalks, Driveways, Fascia, Trim, Doors, Windows and Lighting. Attached or Detached Garage – Slab, Ceiling, Walls, Vents, Entry, Garage Door, Openers, Receptacles, Lighting and Windows. Systems – Water Furnaces, Heaters, Air Conditioning, Duct Work and Fireplaces. Electrical – Panels, Wiring, Circuit Breakers, Grounding, Receptacles, Ceiling Fans and Light Fixtures. Plumbing – Pipes, Toilets, Showers, Sinks, Faucets and Traps. Built-In Appliances – Dishwashers, Microwaves, Range and Oven, Garbage Disposals and Smoke Detectors. Business owners can benefit greatly with a comprehensive inspection which can assist in deciding whether a commercial property best suits your needs and use. 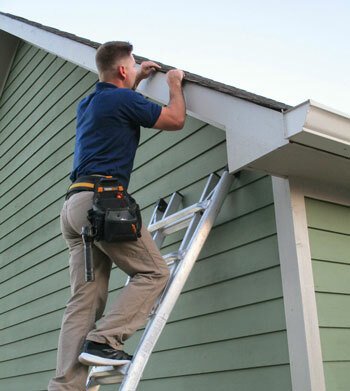 Semper Fi Home Inspections provides a complete Commercial Inspection and unbiased report on the condition of the visible and accessible systems and components of your property. We are fully licensed and covered with Errors and Omissions (E&O) Insurance for you and your realtor’s benefit and protection. We will assess the existing condition, life expectancy and scheduled maintenance requirements of these systems and provide a detailed, digital report on our findings. Semper Fi Home Inspections offers a Phase Building Inspection for four phases (Framing, Pre-Drywall, Post-Drywall and Final) of your new home’s construction to ensure building progress meets industry standards. This inspection after each phase can identify possible defects that need to be addressed by the builder before construction makes these structures and areas inaccessible. 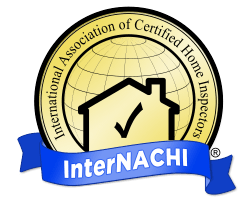 We also provide the Final Phase or Pre-Walkthrough Inspection as a separate service for your home. Before you sell your home, a Pre-Listing Inspection puts you at an advantage. This inspection allows you to discover and address flaws before placing your home on the market. With Semper Fi’s Pre-Listing Inspection, you can help ensure that the sale of your home is free from delays and surprises and proceeds more smoothly toward the closing. A Semper Fi Re-Inspection is a follow-up inspection to your previous full home inspection after recommended repairs and modifications have been made. 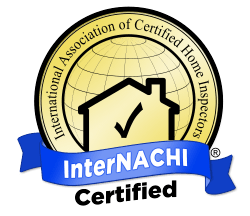 This inspection ensures that work was completed following InterNACHI guidelines and that all issues observed in the prior inspection have been resolved. An annual Home Maintenance Inspection will evaluate your home’s accessible systems and components to determine that they are in excellent working condition and help you avoid future expensive repairs from minor issues that should be taken care of now. Semper Fi Home Inspections performs a 1-Year Warranty Inspection during the 11th month after your new home’s construction. This is a comprehensive home inspection intended to help you identify issues that need to be addressed by the builder prior to the expiration of your 1-year builder’s warranty. As an important part of a property sale or maintenance plan, Wood Destroying Insect Inspections are used to either confirm or clear the presence of wood destroying insects or organisms (WDI/WDO) in your home. We will evaluate the visible infestation and damage caused by insects, such as termites and wood-boring beetles, and decay in accessible areas of your home’s structure. Semper Fi Home Inspections will then provide a report on how to mitigate this damage and guard your home from future infestation. The health and safety of your family is absolutely a top priority! Radon is a naturally occurring, colorless and odorless, radioactive gas that results from the breakdown of uranium in the soil. Radon is also the leading cause of lung cancer among nonsmokers in the United States. Protect your family’s health by ensuring radon levels in your home are below harmful limits with a non-invasive, certified Radon Test from Semper Fi Home Inspections. Thermal Imaging offers a way to visualize certain defects within a home that are invisible to the naked eye. Semper Fi Home Inspections utilizes state-of-the-art infrared cameras to assist in detecting temperature variations that can identify potential problems such as moisture penetration, insulation deficiencies, air leaks and overheating electrical components. A Thermal Imaging scan and subsequent report is also a great way to find solutions for increasing your home’s energy efficiency. 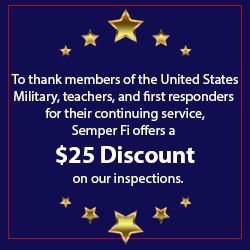 Book your comprehensive Semper Fi Home Inspection today!